Can you believe it's already time to start saving Christmas? Yesterday the Liberty Counsel announced the start of it's eight annual "Friend or Foe Christmas Campaign". When you look through their Naughty and Nice list it's evident that they don't care so much for the religious aspect of Christmas as they do the use of the word "Christmas" in advertising and greetings. After all, nothing saves Christmas like saying "Merry Christmas" every time you go to the store having a Christmas sale and buy more stuff for Christmas. Substituting the word "holiday" is all it takes to make the naughty list. Now for a tax-free donation you can help the Liberty Counsel by getting your own Help Save Christmas Action Pack. On its website, www.LC.org, Liberty Counsel offers a Help Save Christmas™ action pack, which includes educational legal memoranda to educate government officials, teachers, parents, students, private businesses, employees, and others that it is legal to celebrate Christmas. The action pack also includes an “I ♥ CHRISTmas™” button, an “I Helped Save Christmas” bumper sticker and button, and sample ads for use in local newspapers. Legal memoranda, buttons, and a bumper sticker is tons of action. (I like how they trademarked the name "CHRISTmas". It shows they're business savvy.) But wait, what's this? 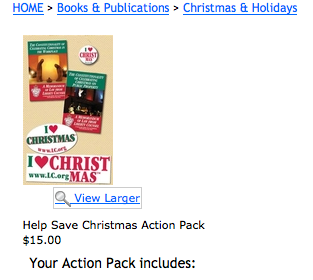 The Help Save Christmas Action Pack is under the "Christmas & Holidays" category. Help save Christmas by telling the Liberty Counsel to use their Help Save Christmas Action Pack to save Christmas and not the Holidays! Oh, and buy lots of stuff for Christmas. Go John Ahern! Save Christmas, defeat the UN takeover of Spokane and stand up for heterosexual marriage. Oh yeah, don't forget the vampires and werewolves. They shouldn't get extra rights!